What I really like about wine growing in Europe are the preponderance of tiny land owners having wine. Sure, there are huge estates in Europe that span into the hundreds of hectares, but there are also vast numbers of small land owners holding in the single digit number of hectares (1 hectare = 2.5 acres) or even smaller. This is true in Hungary and in other countries. But of course, in Hungary things are always a little different. Because of the way Goulash Communism split up land in Hungary, many private and distinct properties on our wine hill are about a quarter of a hectare (0.6 acres) in size. That size of land will typically produce over a thousand liters (260 gallons) of wine. More than enough to keep the land owner and his friends completely intoxicated for the year. But it seems being intoxicated was a higher priority than, say, quality. Of the properties we purchased with intact vines, the placement of wine varieties was clearly without plan. In a single row there may have been up to three different varieties of wine, randomly placed. Clearly, whenever a vine needed replacing when it died, another vine, no matter what type, was just planted in its place. No other rhyme or reason seemed to exist. 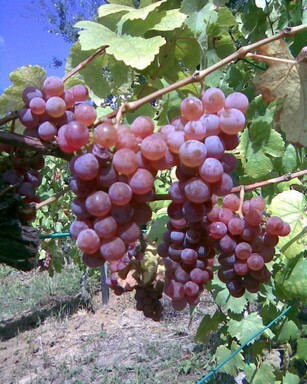 Hárslevelű (This grape variety seems highly susceptible to powdery mildew, as you can see the classic advanced symptom of slit berries at the top of the cluster). And… Actually I have no freakin’ idea. Of course, when planted so haphazard on a small parcel of land it is not possible to create a varietal of any quantity much less quality, as there is simply not enough vines of any one type to make enough to ferment properly. For example, we have never done anything with our Muskotály, as we simply do not have enough of it. The solution for most growers here with a similar variety of grapes on their property? To just toss all the grapes into one vat and ferment. It is called “hill wine” here (since most grapes grow on the volcanic hill). It is not a blend. It is not a cuvée. Those actually requires some planning. And there are actually some excellent blended wine made in Hungary. Nope, in the local case it was just “whatever you got, toss it into the vat” wine. The results are of course mixed. Some times, it is not bad. It depends on the wine maker to some extent and his understanding of the grapes on his property. But problems are still inherent. Not only do the grapes ripen at different times (we often harvest our Tramini a month before our Riesling), but the total harvest of any one variety of grapes will vary from year to year further confounding consistency in the final batch wine. When we bought our first property, the land owner “tossed into the deal” some of the hill wine he made from grapes grown on the property we were purchasing. I took one taste, and threw it out (all 400 liters). Now you can better appreciate why we are replanting.